Handsome Boy had his first public melt down/tantrum this weekend. Now, we’re no strangers to tantrums with Handsome Boy. He is very stubborn and vocal about his needs and wants. At home he has thrown some doozies, but he is usually a bit more reserved in public. We also plan our outings around his schedule and avoid peak fussiness times as well as known tantrum triggers. We were completely unprepared for what happened on a seemingly run-of-the-mill Goodwill trip. Handsome Boy is no longer content to ride around in a cart at the store, nor is he content “pushing” the cart for us. He wants to run free. He is a boy on a mission, headstrong and in charge. We can usually keep him happily confined for short periods of time by finding a toy for him to play with in the basket of the cart. Sometimes we buy the toy for him, but we usually put it back before we go, for any number of reasons (condition, price, too big for our current home, he loses interest too quickly, etc). We almost always leave with a few books for him, but toys are a less common purchase, and really, he has more than we have room for at home already. Not to mention an overabundance of toys at both his paternal and maternal grandparents’ houses. He doesn’t have any idea how good he has it. On this fateful day he spied a minature, Charlie-sized grocery cart that he took great joy in pushing around the store as I shopped. 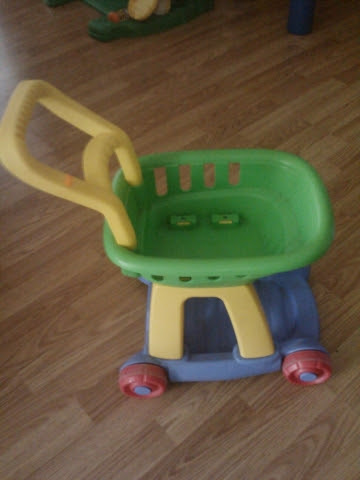 I even put some of my intended purchases in the basket of his scaled-down cart. As much as he enjoyed the cart, I knew it would be stuck in a corner once we got home because we just don’t have the space to push it around. When it was time to go we walked it back to the toy area and parked it back where we found it. He was fine up until this point. I calmly explained to him that we were putting it away and heading to the checkout – typically his favorite part of the trip because he loves to push the buttons on the credit card reader. But as we turned to walk away, he began to cry and tried to grab at the cart again. I picked him up and told him it was time to go, and we said bye-bye to the toy. As I stepped away, he began to wail. Keeping calm, I connected with him, told him I understood that he wanted to keep playing with the cart, but it was time to go. I explained that we couldn’t take the cart home because it was too big for our house. He didn’t care. He wanted that cart. The further we got, the louder he got. I could feel the eyes of judgment, and some of sympathy, upon me as I continued for the exit. He hit me and kicked me as he screamed and screeched. I patted his back and spoke soothingly but firmly in his ear. Once we were outside he relented some. He was still crying heavily, deeply sobbing. My heart was aching for him. I wanted so badly to give him what he wanted, but I knew it was a make or break moment. I couldn’t give in 1) because our reason for not buying the toy was valid – we really do not have the room for it, and 2) we didn’t want to teach that throwing a tantrum means he gets his way. As we approached the car he began to escalate his efforts once again. He returned to screaming, hitting and kicking. He was trying desperately to escape my arms, presumably so he could run back to embrace his beloved toy cart. It was a struggle to get him through the car door, and then bend his flailing body into his car seat. He howled as if in pain as I strapped him in (I double-, then triple-checked that I hadn’t pinched him with the buckle). He threw back at me all of the toy I tried to hand him. After a few more attempts to soothe him, I conceded and got into the driver’s seat, hoping he’d settle down once we were moving. He didn’t. He kept up the heart-wrenching blubbering cries as we drove to our next destination. He was still crying a full 5 minutes later as I parked the car again. His face was red and blotchy as I unbuckled him. I offered him milk and he was barely able to squeak out a timid “yeah” of acceptance. We nursed until his breathing steadied. Then we went into Toys ‘R’ Us and bought him a new set of (small) toy dinosaurs.